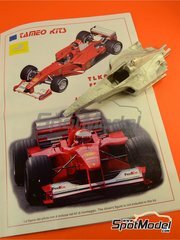 Tameo is a worldwide leader in 1/43 scale modeling, but their 1/24 and 1/64 scale kits are equally interesting. 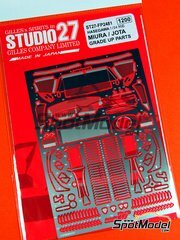 This 1/24 scale kit follows the classic Tameo product line, with white metal parts, decals printed by Cartograf, rubber tyres, metal turned parts and photoetches. 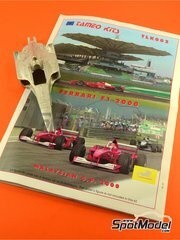 Everyone knows that Tameo is a worldwide leader in race cars scale model manufacturing at 1/43 scale, but their kits in other scales are equally brilliant. 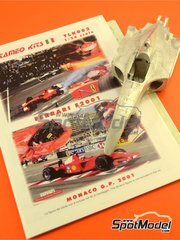 This kit in 1/24 scale follows the classic Tameo product line, with white metal parts, decals printed in Italy by Cartograf, rubber tyres, metal turned parts and photoetches. 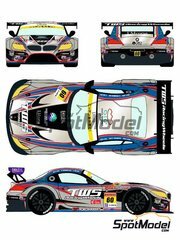 Tameo is definitely a worldwide leader in race cars scale model manufacturing at 1/43 scale, but their kits in other scales are equally amazing. 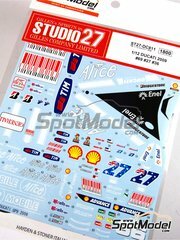 This kit in 1/24 scale follows the classic Tameo product line, with white metal parts, decals printed in Italy by Cartograf, rubber tyres, metal turned parts and photoetches. Tameo is a worldwide leader in 1/43 scale modeling, but their kits in other scales are equally brilliant. This 1/24 scale kit follows the classic Tameo product line, with white metal parts, Cartograf printed decals, rubber tyres, metal turned parts and a wealth of photoetches. 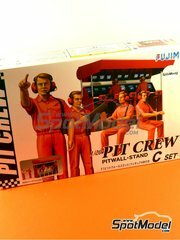 Bring your Formula 1 dioramas to life using these figures and cabin designed by Fujimi. Remember that decals are NOT included. 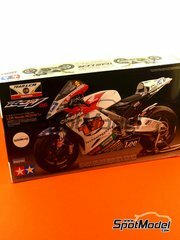 A new version of the classic Honda world championship bike, now with the Casey Stoner decoration. The chassis and other mechanical parts are made in chromed plastic, and the rest of them come in white and metallic grey plastic. The decals sheet is absolutely gorgeous, and without doubts one of the best parts of the kit. During the seventies the Lotus Team started in the racetracks with the Lotus 25, and now we've brought back to you this kit edited by Tamiya a few years ago. 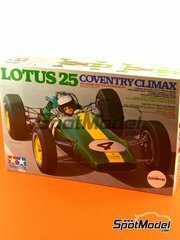 The box includes number decals for several races with Jim Clark at the wheel, as well as a fully detailed engine. 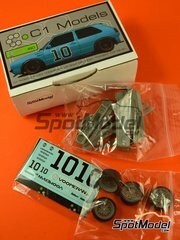 The set includes resin parts, decals, rims and tyres inspired in the Voomeran demo car, although the interior hasn't been modified and some sponsor decals have been simplified in order to be able to manufacture them. 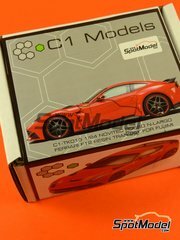 C1 Models offers us once again a very interesting kit, this time for versioning the N-Largo Novitec model based on the Ferrari F12. Fender flares, bumpers, exhausts and many more parts will help you to give your kit a really aggressive look. 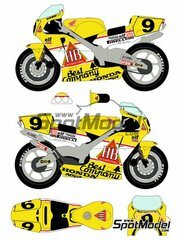 Don't miss Racing Decals 43 first design for a motorbike, but we're quite sure it won't be their last. The decals sheet includes tobacco logos. Do you like the Z4? Do you dare with a chrome background decoration? Do you like Japanese races? 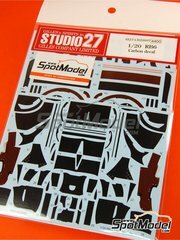 If you're a top notch modeler, search no more: THIS is your decal. Day after day, Kubika gets more competitive at the Rally Championship, and each time he shows a gorgeous decoration. 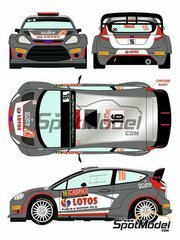 Here are the decals for the Fiesta he drove at the Montecarlo Rally. Remember that the base color of the car is not glossy. 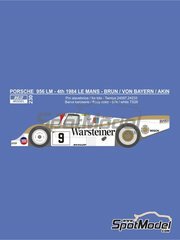 With white color for the background, black for the Warsteiner logo, and golden for the side bands, these decals will make your Tamiya kit look awesome, right? 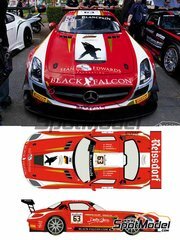 Red and white, fast and powerful, the gorgeous version of the SLS AMG GT3 racing at 24 Hours SPA now reproduced for you by Racing Decals 43 to be used on Fujimi kits. Bright orange, black and white: the perfect colors for a race car. 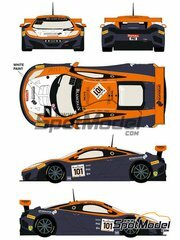 Those were the same colors used at the Spa 24 Hours by the McLaren MP4-12C GT3, and that decoration is now reproduced by Racing Decals 43 in these gorgeous decals. ALL the carbon fibre patterns for your McLaren MP4-12C, nothing less. 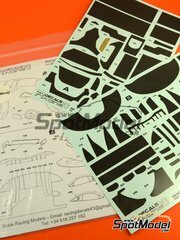 Your spoilers, bucket seats, dashboard, diffuser, … will stand out when you place these decals on your kit. 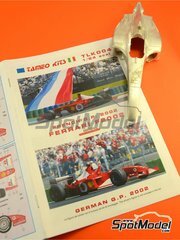 Modern Formula 1 have carbon fibres as one of their main components. And... what's the matter with your RB6? Will you dare not using these gorgeous carbon fibre decals by Studio27? A trio of pilots such as Hayden, Stoner and Kallio, and an absolutely gorgeous bike such as the Ducati Desmosedici GP9, definitely deserve a place in your shelf. These decals include the numbers for all of them during the 2009 season. These two cars definitely set a landmark in the history of Lamborghini, and now you can now enhance both of them thanks to this photoetch by Studio27.